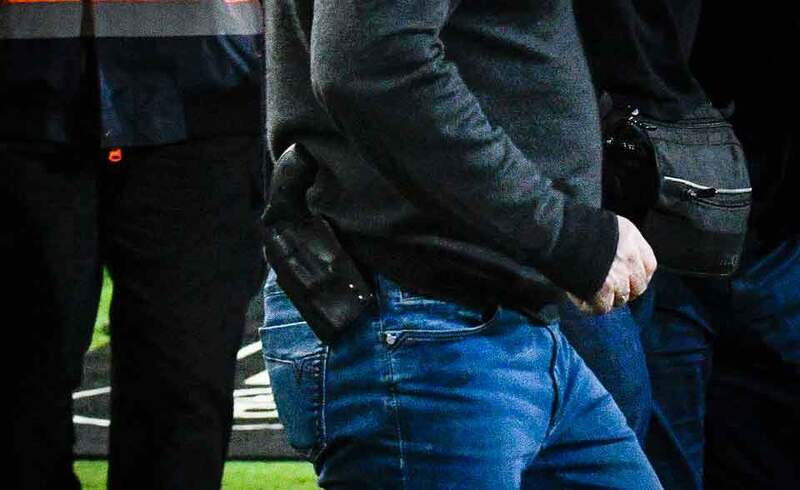 Carrying a gun into a football stadium is forbidden by Greek Law. Reaching for the gun in a threatening fashion takes this to the next level. Demanding the ref to change a decision at gun-point is an altogether novel approach to winning a title. But when PAOK of Thessaloniki scored an offside goal in the 90th minute to win the match, that’s exactly what happened. The goal was not given and the proverbial hit the fan. It took a man of many nationalities – born in Georgia (the country, not the State), Russian citizen and of Greek descent – to lift the “beautiful game” to a new level of disrepute: Ivan (‘The Terrible’) Savvidis, owner of the Thessaloniki Club PAOK is apparently so desperate to win the Greek Championship that he couldn’t care less about proper conduct, decency and decorum. All three terms seem to be words he has never heard of, nor gives a damn about: after all, he is extremely wealthy and so, de facto, above the rule of stupid laws. At least football laws. When the new Hellenic Football Federation president was installed after a lengthy and painfully fraught period of FIFA and UEFA –supervised “normalisation”, Savvidis proclaimed on live television: “He’s our man”. That particular “our man” is Evangelos Grammenos. Savvidis’ man, per the Russian’s own account. The sanctions after the pitch invasion with guns and bodyguards will show how much Grammenos is indeed “Savvidis’ man”. In any normal football federation, this man would have to be banned from football for life. We are talking threatening people with a hand on his sidearm. Savvidis reached for his gun as he approached the linesman who had made the offside call. One must assume that this man has mental issues, at best. Who, in his right mind, would storm on to the pitch in front of thousands of spectators, hand on weapon, and demand a reversal of a refereeing decision. Wrong question. Savvidis answered it by his deranged pitch invasion. But going by the most recent events, not much can be expected from Grammenos and his new-style HFF (duly approved by FIFA and UEFA): After an abandoned match v. Olympiacos where the manager was hit in the eye by some UFO, PAOK of Thessaloniki were dealt a 3-point deduction and games without an audience in the stadium. Miraculously, that initial verdict was overturned only a few days later, last Saturday, and Savvidis’ PAOK were now allowed to have a full stadium for their crucial title match against AEK of Athens. How that decision, or rather how that reversal of a decision, came about, only the Greek Gods may know (and Grammenos, one would assume). But one must applaud Savvidis’ savvy to have had tens of thousands of tickets ready in good time for yesterday’s game within less than 24 hours. Only Zeus might know this but the question arises: could it be that those tens of thousands of tickets were actually already printed, awaiting a reversal of the ban by “his man” Grammenos? Surely not! FIFA are keeping an eye on Greek football, aren’t they? Although their meek statement of today allows for some doubt. While claiming this to be an Hellenic affair, FIFA are forgetting a little tool they have in their box: the FIFA Ethics Code. Paragraph 1 of the Code says: “This Code shall apply to conduct that damages the integrity and reputation of football and in particular to illegal, immoral and unethical behaviour.“ If no complaint is filed, one must assume that carrying a gun onto a pitch and threatening a referee is from here on forward to be considered proper conduct. One wonders whether another person’s integrity is best respected with a gun in their face. Maybe not? And just in case FIFA insist on this being a purely Hellenic affair (as they did), they might want to read this – their own – paragraph: Paragraph 25. 5. states: “The Ethics Committee shall also be entitled to investigate and to judge national cases if associations, confederations and other sports organisations fail to prosecute such breaches, fail to prosecute them in compliance with the fundamental principles of law, or an adequate judgement cannot be expected given the specific circumstances”. Considering the fact that Grammenos is “owned by Savvidis” (his words, not mine), there can be at least some doubt whether he will be “prosecuted in compliance with the fundamental principles of law”…. So here you have it. Or maybe not. Let’s wait and see what the Greek Gods and FIFA’s own Ethics Czars come up with. They seem to have created an awful mess in Greece. And one wonders whether they can fix it now. There does not seem to be much hope.